These soft, fluffy doughnuts are packed with chocolate flavor and topped with a spooky graveyard scene, thanks to crushed chocolate sandwich cookies, a generous drizzling of CandiQuik, and creepy bone sprinkles! Preheat oven to 375 degrees F. Liberally grease a regular-sized doughnut pan with cooking spray and set aside. In a large bowl, combine the first nine (9) ingredients with a rubber spatula until combined and a soft chocolate batter has formed. Spoon the batter into a large resealable plastic bag, seal out the air, and snip off a corner of the bag. Pipe the chocolate batter into each greased doughnut cavity, about ⅔ of the way full. You'll have leftover batter and will have to work in batches; that's okay. Bake the first round of doughnuts for 8-10 minutes or until doughnuts appear set and the tops spring back lightly when touched. Cool for about 3-5 minutes in the pan, then carefully invert the pan and allow doughnuts to cool completely on a wire rack set up over a sheet of wax paper. Re-grease the doughnut pan and continue with the remaining batches. Once doughnuts are cooled, melt your CandiQuik according to package directions, until smooth. Dip the tops of the doughnuts into the melted CandiQuik, allowing excess to drip off. 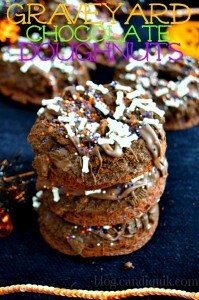 Dredge the chocolate-topped doughnuts into the crushed cookies, then immediately sprinkle with the bone and Halloween sprinkles. Repeat with remaining doughnuts. If you have leftover CandiQuik, like I did, drizzle the remaining CandiQuik on top and add a couple more sprinkles. Serve doughnuts immediately afterward, or store at room temperature, airtight, for another day.